The traditional approach to storing totes has been either to place them on pallets or on racking in a warehouse or to use a automated mini-load system. There are clear advantages of each type of Automated Warehouse. 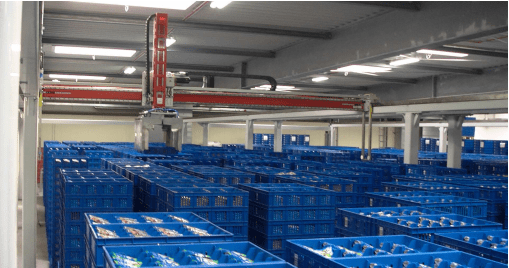 The Gantry Robot can be used as an alternative automated solution. Unlike the mini-load the technology is extremely simple. Three drives operate the whole system. The robot operates from above the working area of the store. Totes, Crates or Baskets are stacked on the floor or a suitable sub-floor. Any area can be turned into a store with little effort. In order to build the stacks it is important that the totes, crates or baskets are stackable and of uniform size. Incoming totes can be stored in homogeneous stacks and picked out of the store as mixed product orders direct to pallet, cage or conveyor. 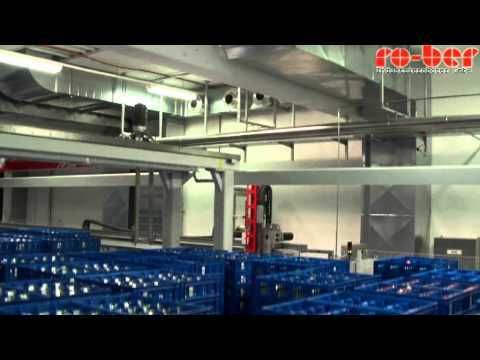 Gantry Robots have been used in cold store applications with temperatures as low as -20 degrees Celsius. They have been used to store empty or filled totes. Comparatively low maintenance when compared to mini load systems.